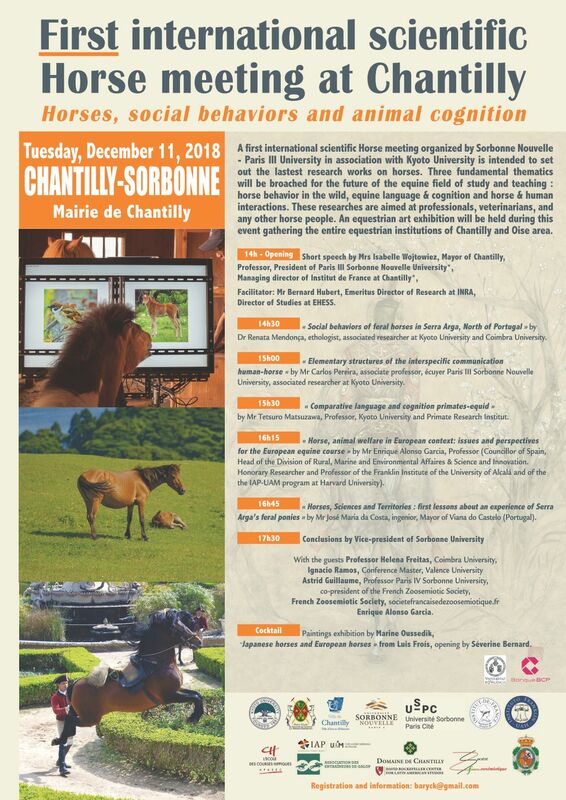 A first international scientific Horse meeting organized by Sorbonne Nouvelle - Paris III University in association with Kyoto University is intended to set out the lastest research works on horses. Three fundamental thematics will be broached for the future of the equine field of study and teaching :horse behavior in the wild, equine language & cognition and horse & human interactions. These researches are aimed at professionals, veterinarians, and any other horse people. 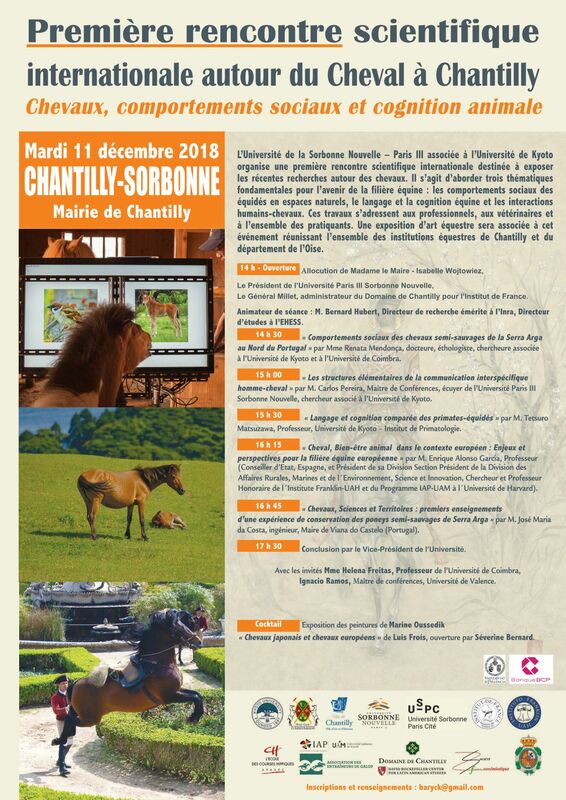 An equestrian art exhibition will be held during this event gathering the entire equestrian institutions of Chantilly and Oise area. Director of Studies at EHESS.
" Social behaviors of feral horses in Serra Arga, North of Portugal " by Dr Renata Mendonca, ethologist, associated researcher at Kyoto University and Coimbra University.
" Elementary structures of the interspecific communication human-horse " by Mr Carlos Pereira, associate professor, ecuyer Paris III Sorbonne Nouvelle University, associated researcher at Kyoto University.
" Comparative language and cognition primates-equid "by Mr Tetsuro Matsuzawa, Professor, Kyoto University and Primate Research Institut.
" Horse, animal welfare in European context: issues and perspectives for the European equine course " by Mr Enrique Alonso Garcia, Professor (Councillor of Spain,Head of the Division of Rural, Marine and Environmental Affaires & Science and Innovation.Honorary Researcher and Professor of the Franklin Institute of the University of Alcala and of the IAP-UAM program at Harvard University).
" Horses, Sciences and Territories : first lessons about an experience of Serra ArgaĄÇs feral ponies " by Mr Jose Maria da Costa, ingenior, Mayor of Viana do Castelo (Portugal). Japanese horses and European horses " from Luis Frois, opening by Severine Bernard.